Do capital protection funds really work? What do you expect when you invest in a capital protection oriented fund? Protection for your capital and for your money to not lose value, right? The capital market regulator, Securities and Exchange Board of India (Sebi) prohibits mutual funds from assuring capital or returns, but fund houses are allowed to devise strategies that minimise the risk of a loss. But is simply getting your money back enough? If, after having invested for 3-5 years, your fund gives nil returns, capital protection doesn’t mean much, does it? What most people are signing on for is protection of capital along with some returns, ideally more than what fixed deposits give. 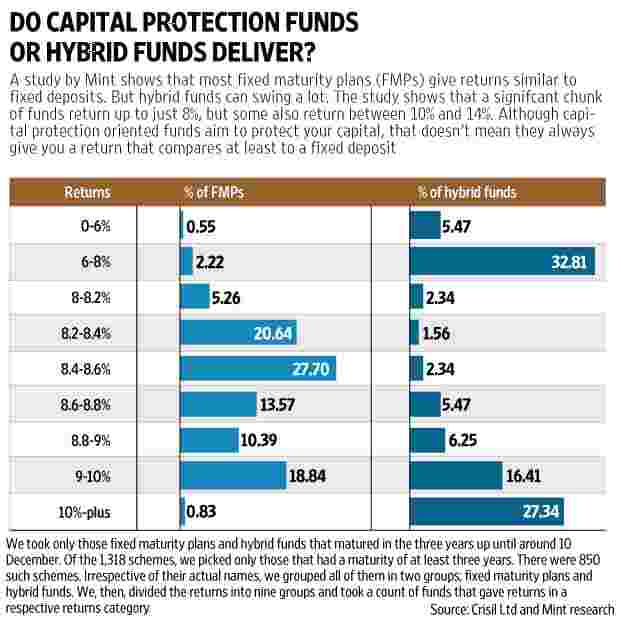 Mint did a first-of-its-kind study of closed-end hybrid funds and realised that not all capital protection oriented funds outperform bank fixed deposits. Yet, at the same time, capital protection funds and fixed maturity plans (FMPs) have not given negative returns. The lowest return in our study is 3.02%, while some funds have given returns as high as 12-14%. But most funds have given returns that are lower than 6%. For the purpose of this study, we included FMPs in addition to capital protection oriented funds that invest in debt and equity instruments. Mint’s study on capital protection oriented funds is important for three reasons. First: since these are closed-end (debt) funds, their performances disappear from public disclosure once the fund winds up the scheme. Although past performance is no guarantee for future returns, it gives an indication of how the fund is likely to perform. Investors who invest in these funds have, therefore, only the scheme’s stated objective to begin with. Second: even though these funds do not assure principal or interest, they are designed and marketed to prevent capital loss. The dilemma is to invest in a product that aims to protect your downside without even knowing if such a product can deliver. Third: it’s not easy to choose. There are more than 1,000 schemes across different categories. But FMPs and capital protection oriented funds seem to have a parallel universe of their own. There are 916 such schemes as of today. Almost every week, one or two schemes mature (since they are all closed-end, they come with a fixed tenure) and new ones get launched. Twenty one such funds were launched on an average every month in 2017; 25 in 2016; and 28 in 2015, according to Value Research data. Up until 2014, when long-term capital gains tax for debt funds used to kick in after just a year, around 70-80 such funds used to get launched every month, on an average. A quick primer before we tell you what our study shows. FMPs are pure debt funds and invest in fixed income securities. Capital protection oriented funds, which also go by the name of dual advantage funds and closed-end debt hybrid funds, invest significantly (around 80-90%) in debt instruments. The rest gets invested in equity instruments. The debt portion grows enough in the scheme’s tenure to recover the principal amount. The equity component is used to generate the returns kicker. Our study showed that FMPs have largely delivered fixed deposit-type returns. But the moment a scheme comes with an equity component, the returns swing wildly. We analysed all closed-end debt schemes— FMPs and hybrid funds that matured in the past 3 years. Crisil Ltd provided us with the data. We took only those schemes that came with a minimum of 3-year lock-in. While only 0.55% of FMPs gave returns of up to 6%, 5.47% of hybrid funds gave similar returns. A majority of FMPs gave returns between 8.2% and 10%. But around 16% of hybrid funds gave returns of 9-10%, and 27% have returned in excess of 10%. “That is the nature of these schemes. FMPs should give predictable returns. Hybrid funds would give variable returns, but ideally not negative," said Rajeev Thakkar, chief investment officer, PPFAS Asset Management Co. Ltd.
Why do most FMPs give returns that are in the same range but hybrid funds give scattered returns? Notice how the majority of hybrid funds have either given high returns (in excess of 10%) or low returns (less than 8%). That is because hybrid funds invest in equities. Birla Sun Life Capital Protection Oriented Fund-Series 3 returned 4.70% over its 3-year tenure. It was launched in January 2011 and matured in November 2013 when equity markets were flat and returned 3.18%. DWS Hybrid Fixed Term Fund-Series 2 (3-year) returned 3.02%; the lowest return scheme in our study. It wound up in January 2014, just before equity markets started a phenomenal recovery in anticipation to the central government elections of May 2014. During this scheme’s tenure, Nifty returned 3.33%. But equities can be risky. If equity markets fall consistently during the scheme’s tenure, the scheme bears the loss. A way out is to invest in Nifty’s call options; a derivative instrument that fund managers buy to participate in the upside market, and at the same time, limit the downside. Say the Nifty is at 11,000 points today. If your hybrid fund invests its equity component (which is usually 5-15%) in shares of companies, then it would have to bear the entire gain or loss. But a Nifty call option (equity shares of companies also have call options, but fund houses are only allowed to buy index call options) is available by paying a premium of just 18-20% of the index value. Let’s assume that the premium is Rs2,000. If Nifty goes up to 18,000 in three years, your fund gets the balance Rs7,000 (18,000 less 11,000) less the premium of Rs2,000 that you paid. If the Nifty index goes down to, say, 7,000, then you lose only the premium you paid. If your fund would have invested in direct equity shares, its entire losses (4,000) would have to be borne by the fund. This looks like a magic pill but it isn’t. If the contract price is expensive, then your fund manager’s upside, through a Nifty call option strategy, is limited. Kumaresh Ramakrishanan, Head – Fixed Income, DHFL Pramerica Asset Managers Ltd , said that if a fund house’s “participation rate in Nifty call option is limited, then the fund would give slightly lower returns than what it would have if it had invested a higher amount." Thakkar says that irrespective of a hybrid fund’s strategy—direct equities or call options—its time of launch and maturity are crucial in determining its fortunes. Beware of the cost that your hybrid fund charges. Although FMPs charge around 0.50% on an average, hybrid funds charge around 2.20%, according to Crisil. “The expense ratios are the hidden reason why many hybrid funds have given low returns. These funds are sold mostly to gullible investors on the pretext of fixed deposit-type returns, but it doesn’t bode well for them," says the head of products of a fund house who did not wish to be named. Ironically, he admitted that “not a single penny" of his own investment is in such closed-end debt funds, although his fund house sporadically launches them. He said many fund houses sell such schemes to gather assets. “Expenses charged by Hybrid schemes are not comparable to expenses charged by FMPs. Hybrid expenses are typically in line with the expenses charged by other open ended debt and hybrid schemes", says Ramakrishanan. “Expenses are high on account of distributor commission. We have to be competitive," said a debt fund manager on condition of anonymity. FMPs are usually bought by high networth individuals and companies that have a view on interest rates and can tactically invest in these funds, based on a 3-year view. But hybrid funds, experts say, get sold to many retail investors. Deepak Chhabria, chief executive officer and director, Axiom Financial Services Ltd, a Bengaluru-based distributor of financial products, said that often the data presented contains only the success stories. “If the maturity coincides with a continuously falling market, then your fund might suffer badly," he added. Avoid capital protection funds and closed-end hybrid funds and stick to open-ended equity and debt funds.